Do you sew vestements if we bring our own materials? And where are you located? 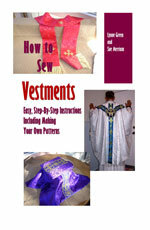 If you wish to provide your own fabric and trim, the cost of making the vestment set would $250. If you are still interested, fill out the form located here. We will contact you with further information on where to send the fabric.